It’s been a while, everyone. I am really glad that I’m finally sharing a recipe I learnt from school with you all. 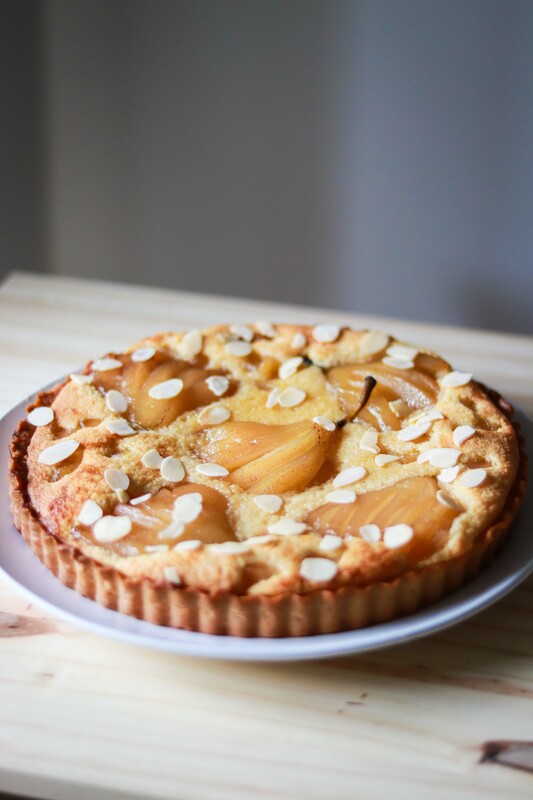 This week, our teacher demonstrated how to make this French-style white wine poached pear almond tart (Pear Bourdaloue); I absolutely loved it and I knew I had to recreate it for myself. Making tarts hasn’t been my strong suit, because up until now I haven’t fully grasped the techniques of handling and rolling pastry. Thanks to school, I had to squarely deal with all my weaknesses and practice. Cope with the huge difference between last year’s baking experience and that of this year isn’t easy either. In LCB, I am constantly introduced all sorts of pastry items that never existed in my world due to my limited exposure to the culinary world. Honestly, the feelings of inadequacy could be overpowering at times, but so is the sense of excitement burning in my heart that I know I just have to keep learning and getting better. For those who are curious about what I’ve made at school for the past few weeks, I’ve attached couple photos at the end of this post as promised. About the tart itself, I know in many sense it matches with autumn theme more, but when you want to eat tarts who cares about the time? Sweet and soft pears shall be the star of this tart – they are beautifully spiced by cinnamon and cloves, with the addition of tangy, sweet flavour thanks to the white wine, as well as lemon and orange peel. Poaching pears requires correct time, temperature and patience. You want soft, sweet, flavoured pears that are not cooked to become mushy in the end. Having the pears together wIth the nutty almond cream at the bottom is simply delicious. I like having this tart when freshly baked (preferably with vanilla ice-cream on top, yummmm), but it’s purely my own preferences. I hope you will enjoy this recipe! When done, take out the pears from the pan to stop the cooking process. Reserve the liquid. When both the pears and liquid have cooled, let the pears continue soaking in the liquid. Keep in fridge until ready to use. Cream butter and sugar by hand or with a mixer until well combined. Adds eggs (one at a time) and vanilla. Mix. Mix in sifted flour and almond meal to form a dough. Lightly flour your working surface. Roll out the pastry to 2.5-3mm thickness. Line a 8 inch tart pan with sweet pastry. Poke littles holes with a folk on the pastry’s base to avoid air bubbles from forming when the pastry is baked. Refrigerate to rest the pastry for 20 mins. Bake the pastry for 12-15 mins until golden brown. Cream butter and sugar by hand of a mixer until well combined. Add vanilla, and eggs (one at a time). Mix well. Add flour, almond meal, and rum (if used). Mix well to form a paste. Fill the tart with the almond cream generously. Put the poached pears on top according to the design you want. Bake for approximately 25-35 mins until golden brown. Sprinkled toasted almond on top if desired. The picture of the white wine poached pear almond tart already made me drunk. I enjoy your shared recipe and fully agree that admitting self adequacy and striving for continuous improvement is the key to success. Thank you 🙂 I had always wanted make pear tart this way.